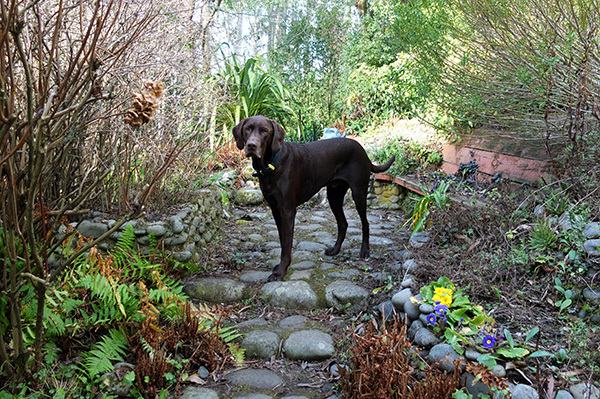 Escher, a German Pointer Chocolate Lab cross, is staying with us. But it was a little premature congratulating him on graduating to country dog status. Almost the next day he jumped three fences, his delighted nose discovering a long-deceased sheep at the bottom of the neighbour's rubbish pit. And did he take the slightest notice of me bellowing? No. When Escher first came here I did wonder if he'd fit into the country ways. The horse manure I was spreading on my garden proved irresistible. But he was a teenager, and I expected him to get into a little, light, country trouble. 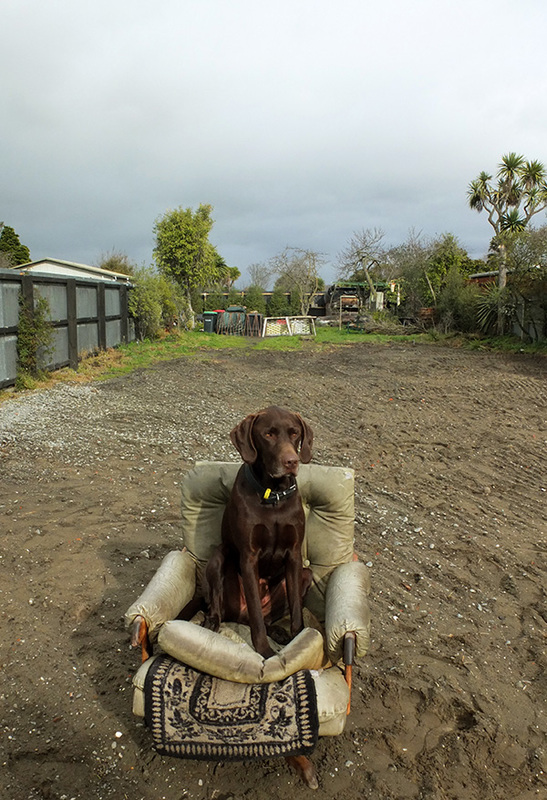 Country paddocks offer a variety of old smelly, rotten, disgraceful things to munch on, or roll in - traps for the unwary urban dog. Obviously there are always safety issues concerning livestock, and fences have to be respected at all times - no jumping or barging through any loose wires. And a good country dog has to respond quickly to calling. Two minutes later is two minutes too late! So I have to keep a very vigilant eye on Escher - a large raw bone makes an excellent distraction. That super-nose can so easily get him into trouble. Stop When Your Tummy is Full! The Hazelnut Orchard is a lovely place for the dogs to wander and snuffle around, when invited. Recently the orchardist (Non-Gardening Partner) was trimming suckers with the three dogs keeping him company. The acceptable country canine behaviour is as follows : crack some of the fallen nuts, gently chew the insides, and then, when your tummy is full, stop. There's a correct style of sleeping for a country dog, too. After all, you're in your dog box each night, even if it's raining or frosty cold. 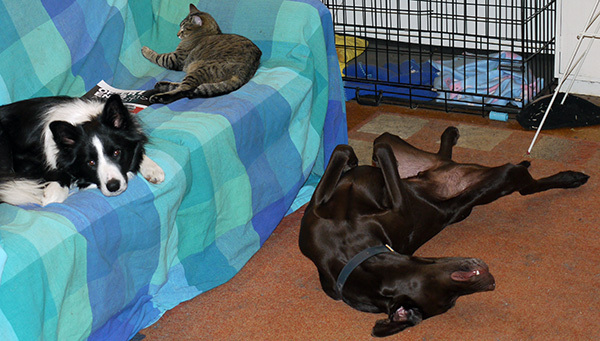 The no-nonsense pose of nose on paws, de rigueur for the outdoors kennel, is also expected in the house. But Escher doesn't get it. He has two house-snoozing positions. 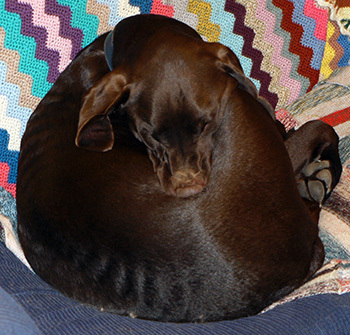 In one, he curls up in the silliest ball, looking like - oops - a round fat dollop of poo (he is, after all, a brown dog). It's one way of keeping warm, I guess. OK, so this weekend we're erecting a tall chicken-wire fence around the neighbour's smelly corner. Escher - behave! Love you, big brown country dog.